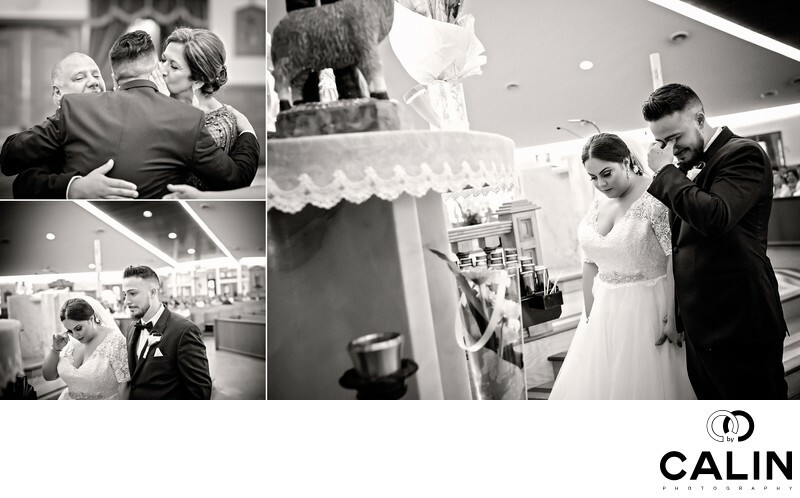 What I liked the most at this Roma's Hospitality Centre wedding was the roller coaster of emotions that allowed me to capture beautiful candid photos. Because the groom's mother passed away a few months before his wedding, the emotions were running high. This album spread includes three images. The one on the top left shows the groom embracing the bride's parents during the wedding ceremony. The mother of the bride's kissing the groom's cheek while the father of the bride is patting him on his back. Underneath this photograph, we see the bride in tears by the altar. She's on the right and is wiping a tear while the groom, on her left is making an effort to hold his tears. The image on the right is the largest on this album spread. It depicts the bride and groom bowing in front of the altar. In this touching wedding photograph the groom broke down in tears, obviously remembering his mother who sadly, was not there to enjoy his wedding. These three strong images do not feature special photography techniques that makes them stand out. However, the are unique because of the powerful emotions they elicit. I look at them I tear up. Preserve the photojournalistic nature of these images, I process them in black and white. Besides adding some film grain, I applied dodging and burning emphasize the subjects in these images. Sometimes, in wedding photography powerful emotions are more important than crazy techniques or angles in creating outstanding images.